The Yawanawa and Surui indigenous tribes of the Brazilian Amazon are in the midst of a renaissance that involves reclaiming their lands and cultural identities. And in an effort to set the record straight on their own unique story, the peoples recently published two books documenting their histories in their own words. Originally posted on the Forest Trends blog. 26 January 2017 | Across the Americas, indigenous and traditional communities have long struggled to assert their stories into a history written largely by foreign newcomers – one which continues to drown out pre-colonial voices. But in the Brazilian Amazon, the Yawanawa and Paiter Surui indigenous tribes are doing their part to set the record straight – in two newly released books that document their histories in their own words. For the Yawanawa and Surui, who are currently experiencing a renaissance after reclaiming their lands and reasserting their cultural identities, these books represent an important step in eternalizing two cultures that were on the brink of extinction in the decades following contact with Western society. Traditionally, these tribes shared their knowledge and creation stories through oral storytelling, but in a world where oral traditions have been largely displaced by written record, these new works offer a catalyst for cultural survival. In addition to inspiring in Surui and Yawanawa people a renewed pride in their unique heritage, the books aim to communicate some of the important lessons that these communities have to offer the Western world. “A History of the Beginning and the End of the World: The Paiter Surui First Contact” was released late last November in the town hall of Cacoal in Rio Branco, Brazil. The book contains 16 first-person accounts from elders in the community – men and women who have survived violence, disease, and sadness, and who exemplify Surui resilience. Theirs is a tale of determination, humanity, and bravery, but also one that paints a portrait of life in the “old times” before contact with the yara, or white man, in 1969: from celebrations and sacred rituals to their community’s traditional cuisine and mastery of medicinal plants. The book was written by Surui leaders, notably Gaami Anine Suruí, who traveled to the Sete Setembro Indigenous Territory with the research team IKORE. Fittingly, the text was translated from the Paiter language to Portuguese by the young members of the Surui Paiter community. In a world where oral traditions have been largely displaced by written record, these new works offer a catalyst for cultural survival. Intergenerational exchange is also at the heart of a children’s book released in the same month by the Surui tribe’s neighbors to the west – the Yawanawa community of Acre, Brazil. Written in both Portuguese and the Yawanawa language, “Vakehu Shenipahu: Children’s Tales of the Yawanawa People” documents seven stories that have been passed down for generations through oral storytelling and ensures they will be passed on for generations to come. The narratives were recited from memory by the oldest Yawanawa Paje, or spiritual leader, the late 103-year-old Paje Tata, shortly before his death last month. But it’s the colorful imagination of the Yawanawa children who illustrated these stories that brings them to life: jaguars and turtles play games together in one story; elsewhere, a rare Amazonian rodent transforms into a man. The stories instill a respect for all living creatures and, the Yawanawa hope, transmit long-held values that will help the young live bravely in the face of future challenges. Coinciding with the inauguration of a traditional community center, or Shuhu, the book was recently launched in a celebration that honored the young illustrators from seven different Yawanawa communities. 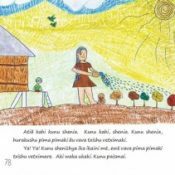 Like the Surui compilation, the Yawanawa children’s book was written with the support of Forest Trends’ Communities Initiative and made possible by the generous support of the IKEA Foundation and Fundo Vale. Publications like these serve as a bridge to lessen the cultural and generational gap within communities that have endured the hardships of cultural assimilation. For the Surui, Yawanawa, and other indigenous Amazonians who have only recently come into contact with broader Brazilian society, this kind of storytelling does more than strengthen bonds between past, present, and future generations; it also transmits to the global community some of the valuable wisdom held by these long-time forest stewards. Will Tucker is the Senior Communications Associate at Forest Trends. He is a writer with a background in climate change communication, history, and public health. Iza Hoyos is a Program Associate for Forest Trends’ Communities Initiative, working mostly with the program’s partners in South America. She has a background in documentary films and has experience in environmental and social justice issues in Latin America.